I have always loved science fiction books that cover outer space firsts. First colony on Mars. First colony on another planet. First alien encounter. First alien war. 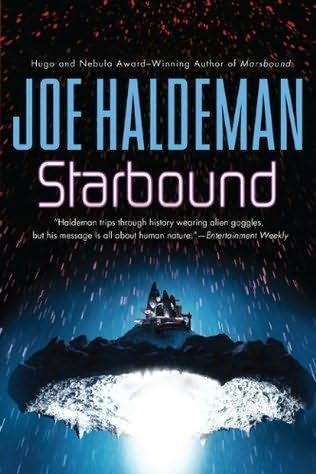 A while ago I read Marsbound by Joe Haldeman. It must have been at least a year and a bit ago, since I couldn’t find a review of it on my site, and my OCD no longer lets me read a book without reviewing it, or at least mentioning it. Marsbound is the first in this series, and describes a world on the brink of first colonization of Mars. The hard work has been done, and now the more casual colonists are arriving to begin their life there. Of course something goes horribly wrong, and that kicks off a whole series of events, including the near destruction of every living thing on Earth. Which brings us to the second book: Starbound. The beings responsible for the near destruction of earth are still out there, and now humans must try to find a way to communicate with them, before the ‘Others’ find out their little plan didn’t quite work, and come back to finish the job. Of course, with a being that is so powerful it can sneeze and wipe out a planet, you can’t exactly threaten them, so the approach has to be a little more subtle. There’s some good science fiction in this book, interesting and fresh concepts. Let’s face it, it’s hard to be truly original in these types of stories. I’m not the most widely read science fiction aficionado, but the world Haldeman creates definitely felt original. The book was a quick read, and I liked it. I just didn’t like it as much as Marsbound. The story is told from three different first person points of view, and the reader is forced to figure out who is speaking based on who they are talking to in the room. i.e. you have to narrow it down by the process of eliminating who they are talking to. Sometimes this takes a page or to, and I found it distracting. Luckily, one of the viewpoints was a little bit more distinctive (being an alien). Quite a few times I had to go back a page or two to figure out who was talking. I’m not a big fan of making the reader do that much work. Start with Marsbound. You’ll like that one. Read this one if you’re a big fan of Haldeman. Otherwise, I’d give this one a bit of a ‘Meh’ rating. It could have been better.